Summit's Jack Anderson (22) takes a shot during the first half of the Tigers' 48-42 win over Eagle Valley on Jan. 22. 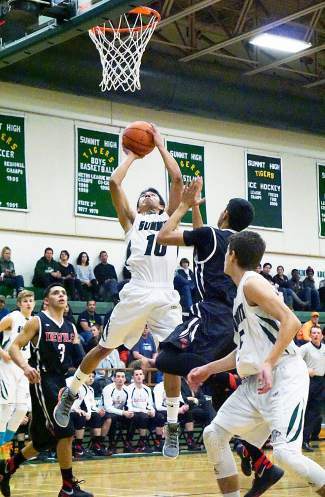 It was the first win of the season for the boy's basketball team. 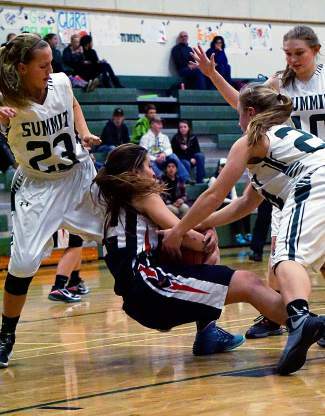 Summit's Cassidy Bargell, left, looks to pass the ball with Eagle Valley's Regan Bossow defending during a home game in early January. The girl's team has struggled with shooting percentage, but they're quick with rebounds and strong on the outside of the arc. Summit's Jesus Moya (10) goes after a rebound during the first half of the Tigers' 48-42 win over Eagle Valley at home on Jan. 8. It was the first win of the season for the boy's basketball team. Summit's Turner McDonald, left, and Andrew Shaw, right, go after a loose ball with Eagle Valley's Dawson Keller during the second half of the Tigers' 48-42 win at home on Jan. 8. It was the first win of the season for the boy's basketball team. 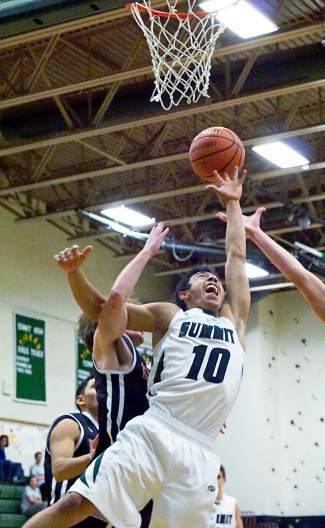 Summit's Jesus Moya (10) takes a shot during the Tigers' 48-42 win over Eagle Valley at home on Jan. 8. Moya came through in several clutch situations, including a momentum-shifting set of points near the end of the first half. FRISCO — What a way to start the regular season at home. 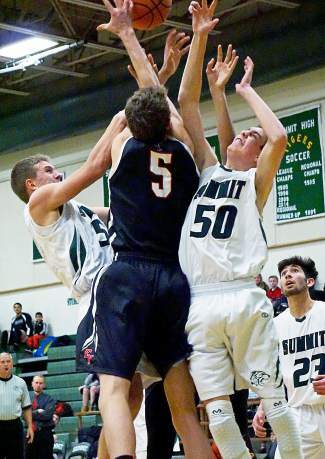 On a snowy Friday night, Summit High School’s two varsity basketball teams squared off against Eagle Valley and split the rivalry down the middle: A loss and a win, both earned by the Tigers in the final few minutes of each game. Even the scores were mirrored: Girls down 42-48, boys up 48-42. 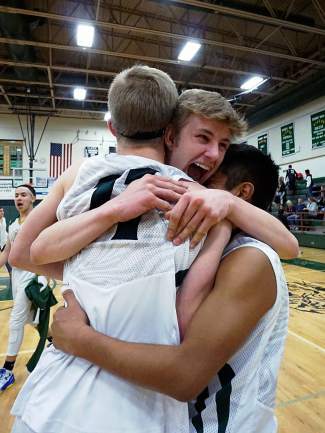 It was the boy’s first win of the regular season (and first win in the 4A Western Slope) after a poor start, including a forgettable Fort Morgan tournament, a 67-35 rout against Rifle before Christmas and a 9-point loss to Buena Vista on Jan. 5, when Summit went down 65-56 after putting up an impressive 22 points in the third quarter and 20 points in the fourth. Head coach Paul Koslovsky admits that his team has struggled in the first quarter (call it half) all season. The first eight minutes against Eagle Valley (3-6) were no different. The starting line is quick and aggressive and cohesive out of the arc, but as soon as players start driving to the basket they either make sloppy mistakes or just can’t sink a shot. The team missed all eight free throws and at least six shots from the field in the first. Then again, maybe molasses momentum can rub off on the other team. After four minutes into the first quarter the score was 2-2. The Devils looked shaky but slightly better, earning five of 13 points on free throws. And they should’ve sunk the remaining, plus another six or eight from the field. It was the story of the first half: Sloppy shooting on both sides, right up until the final 20 seconds. That’s when the Tigers found their hands and made the most of precision passing, feeding the ball to junior Jesus Moya and managing to draw a few penalties of their own. With less than 10 seconds to go, right after back-to-back scoring possessions, Moya (the guy with 19 points against Buena Vista) had a steal in Tigers territory and sunk a three at the buzzer. Score: 22-19 Devils. The Tigers were fired up, the home crowd was fired up, the Devils were up on the scoreboard, and both teams entered the second half ready for a fight. Summit slowly picked away at the lead until the middle of the third, when a few steals and solid drives in the paint tied the game 29-29. Both teams then went back and forth, finally finding their respective grooves to reach 32-32 in less than a minute. That’s more scoring than either team did in the first four minutes of the game. Summit nearly let penalties ruin their momentum. 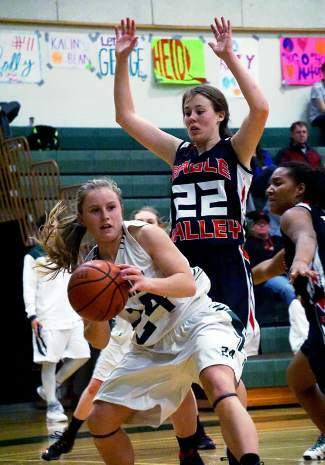 They had 10-plus as a team, but luckily Eagle Valley missed six of eight free throws in the third quarter. The Tigers eventually pulled ahead to 37-33. The fourth was all about penalties and penalty shots, and again, luckily, Summit came out on the right side of both. They let the Devils tie it at 40-40 with three minutes remaining and kicked it into overdrive. Moya and fellow junior Wilson Fisher played patient, persistent ball with a two-on-two breakaway that put Summit back in the lead. It’s where they stayed, but the final two minutes were a roller coaster. Summit missed three two-pointers and one three-pointer that would’ve secured the win, while Eagle Valley was finally making free throws. When Moya stretched the lead to 48-42 with 20 seconds left it was over. The team showed up late, just as it always does, and now it’s just a matter of finding shots earlier. The boys play Battle Mountain next at home on Jan. 12. Game starts at 7 p.m. The Lady Tigers (3-4) have enjoyed a smoother start than the boys. They had a string of three wins in mid-December before dropping one to Rifle, a 52-28 loss right before the holiday break. The girls were looking to right the ship against Eagle Valley (6-3) at home and, for much of the game, they were neck-and-neck with the fast-paced Devils. Sounds kind of like the other Tigers. And, like the boys, the girls have trouble maintaining momentum and making shots when they matter. In the final two minutes of their game, they let a slim lead slip with a few sloppy passes and ended the game down by six for the tightest loss of the season. The girl’s next game is against Denver West at home today. Varsity starts at noon.